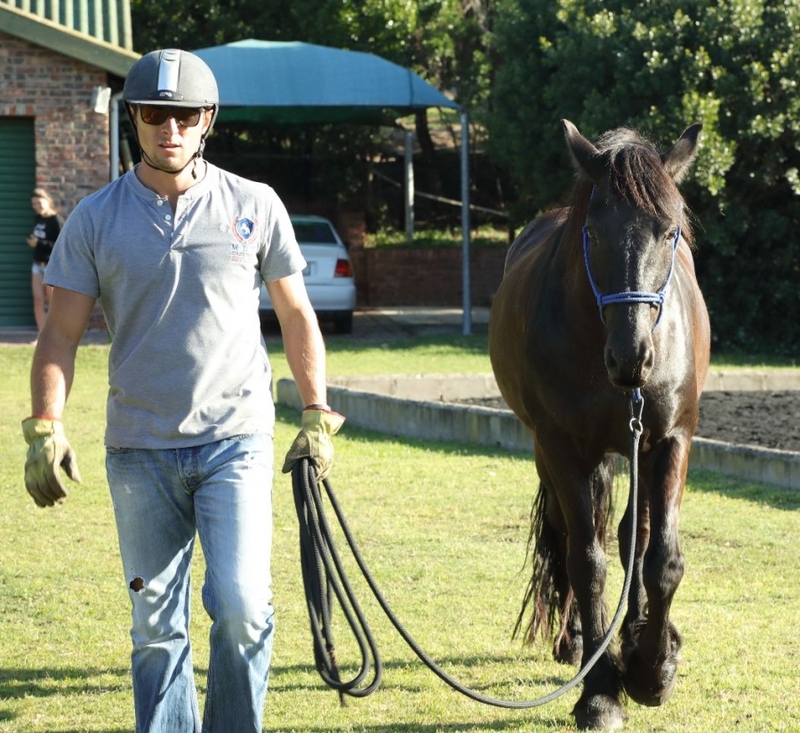 Michael Kenneth de Vrye, AKA ‘Magic Mike’, is a 31 year old Equine Behaviourist from Port Elizabeth, South Africa. 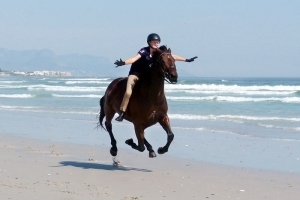 He was born into a horsey family, and began his equestrian career through work riding for his aunt – Diane Botes of ‘First for Horses’ – one of South Africa’s leading coaches and dealers in showjumping. 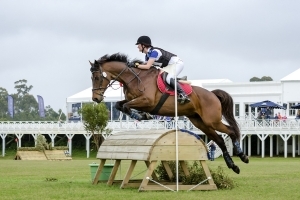 Having sourced and trained multiple top level champions and derby winners, First For Horses is certainly one of the biggest names in the country’s equestrian industry. However, Mike found his passion in a different aspect of the equestrian industry, and ended up parting with First For Horses to pursue a path in Equine Behaviourism. Though he has done some work with riding and sport horses (including my own De Niro), the majority of Mike’s work is done at the track, working with behavioural and performance problems in racehorses. It was one of these racehorses, Port Elizabeth favourite ‘Gogetthesheriff’, who made his name as a behaviourist. A very talented horse, Gogetthesheriff’s career was almost destroyed by his behavioural problems until Mike, brought in as a last resort, finally found the answer to begin turning the horse around. He has since gained quite a reputation at the track, working for many of PE’s top trainers, and – when he’s not ‘holding their hooves’ – he's watching ‘his’ horses race from the comfort of the VIP box. 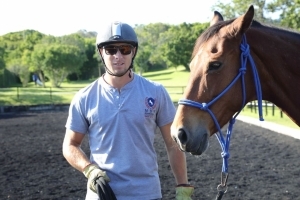 Having been lucky enough to see Mike’s work at the track, and work alongside him in backing my young warmblood, I have taken the opportunity ask a few questions of this young rising star in the South African equestrian industry. How would you describe Equine Behaviourism? 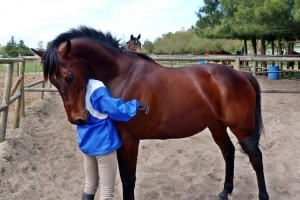 Equine Behaviourism is a way in which a human works with a horse so that the horse understands what we want from them. 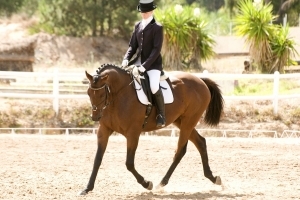 It is done by using natural cues that another horse would give in a herd situation. I use these cues to get the desired behaviour out of a horse, pressure is applied when an undesired behaviour is shown. The horse then learns that it is more pleasant to behave a certain way. I use the saying that stupidity costs calories. What I mean by that is if the horse doesn’t want to behave he will work, once he behaves himself he gets to stand and relax. I must add that before I start to work with a horse I make sure that they are as pain free as possible. The whole basis of my work is body first then mind. 90% of the horses that I work with will have some pain related issue that is normally causing the undesirable behaviour. 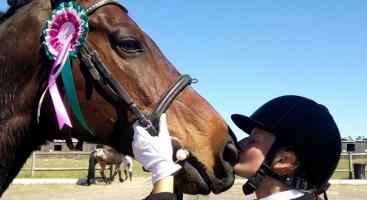 What is MDV Equestrian, and what are your dreams for its future? 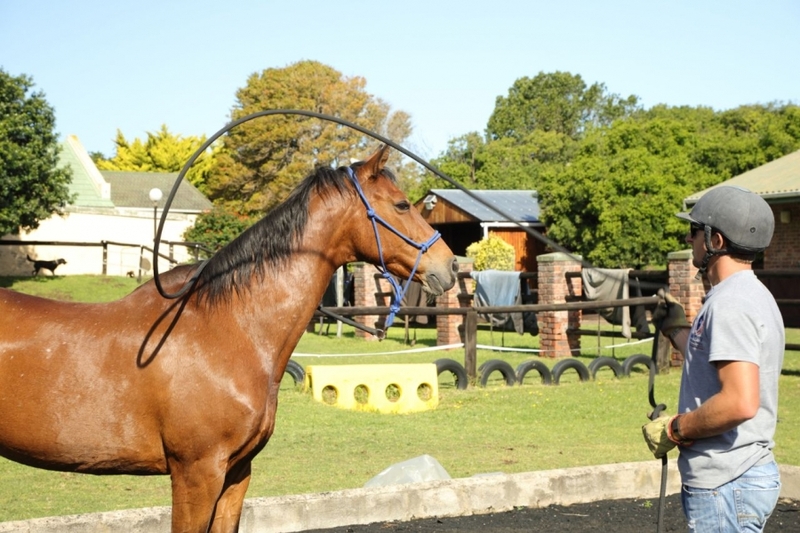 MDV Equestrian provides horse behavioural sessions by me personally. These sessions can be for any issues that you experience with your horse including anxiety, spookiness, boxing problems, backing or anything else that you have a problem with. 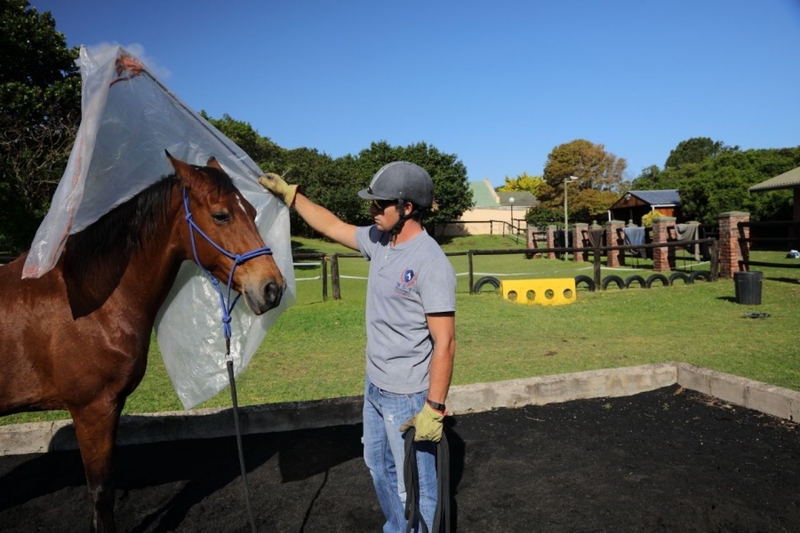 The goal for MDV Equestrian Is to become the number one equine behaviourist in South Africa. What did you do before you became a behaviourist? Before I was an Equine Behaviourist I was a professional cricketer. Fortunately I never reached my full potential. Cricket found me in a funny way, it happened when a friend of mine invited me to join him one afternoon at the club he played for. To my surprise and everyone else’s, I had this very unique and rare ability to bowl very fast. At the age of 21 I embarked somewhat reluctantly on my cricket career. Having then to put my passion on hold wasn’t easy, I always had plans to be involved with horses when I was done with cricket. My career was a bit back to front, barely out of playing club cricket with my friends on the weekend socially, I was offered an IPL contract, which is one of the most sought-after contracts in world cricket. For reasons unknown to me it never materialized. It wasn’t long after that I had offers to play in Australia and by 3 franchises in South Africa, my local franchise being one of them. I ended up signing with the Highveld Lions in Johannesburg, South Africa. I signed a few days after surgery on my ankle which ruled me out for the whole season. A year later after spending most of life in the gym and rehab I was then unleashed again to bowl and bowl fast. Due to the speed I bowled my body couldn’t handle the stresses and strains and I kept getting serious injuries at all the wrong times. So when all was said and done at the age of 29 I walked away, disappointed that I never reached the highs that everyone thought I was destined to. At the same time I wouldn’t change it for the world. There was no better feeling than bowling at 150 km, seeing the ball shatter the stumps. To be honest I wasn’t half as passionate about cricket as I was about working horses. So these days I play cricket every now and then with friends for fun. What made you decide to become a behaviourist? I saw a video when I was 15 of someone doing a demo on natural horsemanship, and it intrigued me because of how easy it was for this person to work with and ride the horse. So naturally I wanted to make life easier for myself with all the horses I rode. How did you become a behaviourist? Through many years of studying the top natural horsemen, I put together my own methods to deal with the four types of horses. (Left Brain Introvert, Left Brain Extrovert, Right Brain Introvert, Right Brain Extrovert). What are these four types? The 4 types of horses. You get left brain extrovert or introvert. Then right brain extrovert or introvert. Left brain extroverted horses are very playful, mischievous, curious and love to nibble on things. They are always full of energy. Left brain introverted horses can be very lazy, stubborn, argumentative and pushy. 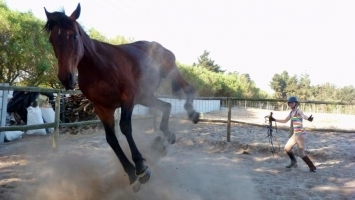 Right brain extroverted horses can’t stand still and are hyper alert. Love to bolt, rear and run you over every time they get a fright. They are also very spooky horses. Right brain introverts are unpredictable, shy and timid. Whenever they are in fear they freeze up then explode. They are very unconfident and distrustful. Like every horseman, I have a great passion for horses. I only want the best for my horses that I work with. These natural methods make my life so much easier by helping me to understand all my horses as individuals. Understanding how the four types of horses think and behave put me at a great advantage to curing the horse’s problem. What are the greatest rewards and challenges of your career choice? The greatest reward has to be seeing the smiles on my clients’ faces when their horse is able to overcome their problem. It’s a perk that I’m doing what I am passionate about. There is no better feeling than curing a horse that had a serious problem and giving it a 2nd chance in life. The biggest challenge would be trying to get people to understand how my work will benefit them and their horse. To date, in a short space of time I’ve managed to convert a few influential horsemen due to them following my work. They are now approaching me to cure their so-called problem horses. So far so good. What are your favourite and least favourite things about your job? I’m doing what I am passionate about by working with horses and I love helping people and meeting new people. Least favourite thing is when it rains and the wind blows at the same time. What is your most difficult case to date? This is definitely Gogetthesheriff. He had terrible anxiety problems every time he went near the racetrack. He would be fine at home but at the track he was a complete nightmare. He would be dripping with sweat and running in circles. That wasn’t what I was brought in to cure though; getting him into the starting stalls was an even bigger problem, he wouldn’t go near them. The first time I saw the handlers trying to load him was one big boxing match. Once he was loaded he would panic violently, rearing and thrashing and it was just a matter of time before someone was going to get seriously hurt. In 3 weeks I had managed to get him passed and back to racing after he was banned for 3 months and the trainer had struggled to pass him for another 3 months. Total of 6 months that he didn’t race due to his problems. I am still working with Sheriff. In 2018 Gogetthesheriff will be aiming to run in The Triple Crown, so in January 2018 the hard work begins, this is a horse that can let you down if he feels like it, so it will be my job to keep him happy and relaxed so that the can perform at his peak. That’s a hard one. I’ve worked with lots of horses. Any left-brain extrovert is normally easy for me to fix. To name one would be hard. What do you think of traditional natural horsemanship, and the ideas of Pat Parelli, Monty Roberts, etc? I know that traditional natural horsemanship gets a bad rap from lots of people. Those that dominate the horse into submission, I don’t agree with. I agree to move the horse’s feet but not until it can’t move and then they put the saddle on. Let me tell you even a horse with no energy will still find the energy to buck you off. Those two names had an enormous influence in my work when I started. As the years went on I started to follow more and more people. I dare say that I am different to any of the trainers and that I’m reinventing equine behaviour techniques. What I can say is that over the years I’ve just gotten a better feel for what I’m doing. The advantage is that I know the answer to the question I’m posing to the horse and how he will behave when introducing something new or that he is frightened of. What advice would you give somebody looking to get into equine behaviourism? Make sure that you find a good equine behaviourist to teach you. If you try to do it on your own and you don’t understand what you are doing you will quickly run out of patience and get frustrated. I’ve seen people with plenty of patience that don’t really understand what they are doing and give up. I haven’t had a single one of my clients give up yet because they have a good understanding of what they need to achieve. Patience with understanding; that’s the key. What is one thing that you wish you could tell every horse owner? It doesn’t have to be difficult or a constant fight. 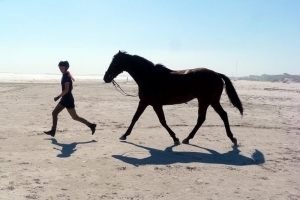 If you are able to understand your horse and your horse is able to understand what you are asking of him or her, then interacting with your horse, whether on the ground or on their back, becomes a lot easier and more enjoyable.